The Starz adaptation of Stephanie Danler's 2016 novel is so unoriginal and unmotivated, it's infuriating. And yet, “Sweetbitter” never grows beyond its basic beginnings. Stephanie Danler’s adaptation strains, at times, to make its cartoonish mix of restaurant servers feel unique, but everything that’s special about this story is only labeled as such by the show itself. We’ve seen it all before, so many times over, and the episode arcs, setting, and general character dynamics do nothing to make this take interesting, let alone fun. Instead, mistakes define the series, including one big one: Tess, the young woman living her dream in the Big Apple, is never given a dream at all. By all accounts, Tess’ main drive is to find a new place to live, and she accomplishes that within the first few minutes of the series. Those early scenes where she scrapes together funds for food and rent touch on the difficulties of affording a new life in NYC, but as soon as she lands that restaurant gig, everything is gravy. She’s there. She’s living in a “city lit up, loud, and full of people” — just like she wanted. She’s done it. But the show aimlessly pushes onward, without giving Tess a goal besides keeping her job (and that’s never really in jeopardy). Played with the utmost doe-eyed naïveté by British actress Ella Purnell, Tess quickly becomes fascinated by the oh-so-ordinary world around her. “Sweetbitter” is all about one restaurant, how it’s run, and the unusually tight-knit members of the waitstaff who strive to move up the ranks within this business instead of using this job to support another life outside of serving. That alone is out of the ordinary — “Party Down” this is not, where the waiters all want to do something else — but it’s not fully explored. “Sweetbitter” doesn’t feel like a close look at what it’s like to be a professional server so much as it wants to be a character study about people with a lack of character. 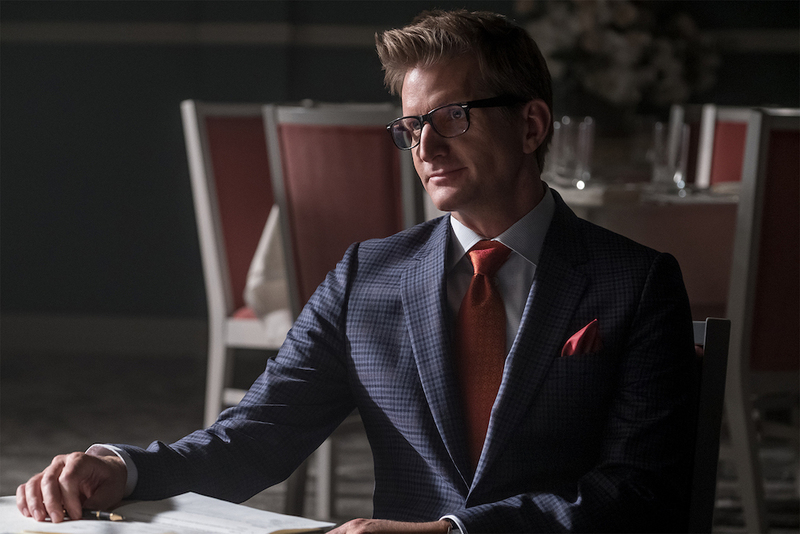 There’s the peculiar restaurant owner Howard, brought to eccentric life by the wonderful Paul Sparks, but it’s only his blunt way of speaking and fashion sense that make him interesting. What’s written about the man himself is one-dimensional, as are most of the other characters. Simone (Caitlin FitzGerald), an experienced and valued member of the waitstaff, comes closest to being well-rounded. She mothers Tess a bit and has earned Howard’s oft-closed ear, but there’s a mysterious aura around her that’s superficially preserved. Like her friend Jake’s highly questionable Massachusetts accent (Tom Sturridge is also from London), she’s unintelligible only because the writers want her to be, which eventually reads as though they have nothing meaningful to say. Toss in a few friends with only one or two discernible traits — Scott (Jimmie Saito) is bossy, Ariel (Eden Epstein) is horny, and Sasha (Daniyar) just wants to have fun (plus a promotion) — and “Sweetbitter” grows stale while sticking to its predictable pattern. Even a time-jumping episode that ends where it begins tells the exact story it foreshadows. It’d be easy to blame Tess herself for these problems, given how pointlessly self-obsessed she is, but it’s hard to tell exactly how old she’s supposed to be. Her childlike behavior would be more forgivable, though still uninteresting, if she was 17 instead of 24, but she’s serving and downing liquor, so odds are she’s old enough to care about people other than herself. It’s not that she’s self-centered or even unlikable (a silly reason to chastise a TV character); it’s that her lack of motivation makes her boring. Perhaps worst of all, “Sweetbitter” takes Starz in the opposite direction its originals department has been heading of late. Though the network has yet to find a breakout mainstream hit among its half-hour offerings, what it’s put out has been challenging, ambitious, and altogether original. From “The Girlfriend Experience” to the upcoming “Vida,” a Starz series should stand out for the right reasons in a crowded marketplace. “Sweetbitter” is the opposite. It feels like an ultra-safe play toward a younger audience that’s only interested in seeing an overly generalized version of themselves onscreen. It’s shallow to the point of being narcissistic, and that’s not the kind of series anyone needs. “Sweetbitter” premiered Thursday, April 26 at the Tribeca Film Festival. The Starz debut is set for Sunday, May 6 at 8 p.m. ET.